My thanks to The Talmud Blog for inviting me to respond to Amit Gvaryahu’s review of Scripture and Tradition: Rabbi Akiva and the Triumph of Midrash. I find myself in the odd position of responding to a review that is generally positive and in certain passages very generous in its praise. Nonetheless, in what follows I will address some of the points Gvaryahu raises in his review, and, more importantly, those that he does not. (Due to space considerations, I have abbreviated some of the Sifra passages I cite). “בוהק … טהור” מלמד שהבוהק טהור. “a rash … is pure”—this teaches that a rash is pure. The first two are literal restatements of the language of Scripture; the third a midrashic expansion that “introduces” the most self-evident conclusion—that “all living creatures that move in the water” includes fish. Setting §2.1 alongside these derashot lessens the burden placed on it (calling one derashah into question does not do invalidate the broader point), and also makes the “tautology” reading more compelling (it is one of several Sifra glosses that, literally or substantively, merely restate the language of the verse). The same holds for Gvaryahu’s response to §2.6. While I, again, gratefully acknowledge his correction regarding halalim, the point of my analysis there is the odd structure of the Sifra’s reading of בני אהרן הכהנים: it first proposes a reading (yakhol) concerning בני אהרן as though הכהנים were not stated right there, and rejects it due to the presence of הכהנים; then proposes a reading concerning הכהנים but rejects it due to the presence of בני אהרן. Why raise a possibility excluded by הכהנים to begin with, when the word is modifying בני אהרן? And why repeat the procedure, artificially ignoring the presence of בני אהרן only to then draw the phrase back into the conversation as a foil to the proposed reading? Even if the Sifra is concerned with redundancy, why address it in such a convoluted manner? Here too, the additional examples buttress the claim that §2.6 is a fort-da derashah, even as they lower stakes if any one derashah is excluded from this set. The above derashot differ rhetorically—§3.9 is a yakhol … talmud lomar argument, while §3.10 a miʿut gloss—but are pragmatically identical: the word “day” precludes the broader reading that includes nighttime. Pragmatic redundancy is a strong indication that a “non-native” element has been introduced into the hermeneutic system. More importantly, the yakhol and minayin derashot in the anonymous Sifra (broadly speaking—I note exceptions) differ from the Rabbi Ishmael midrashim and most named tannaitic derashot in that they conclude with the same verse that initiates the discussion. This is a deeply problematic issue: if verse X legitimately raises the possibility of interpretation P, how can the same verse then exclude P (“X” yakhol P … talmud lomar “X”)? Or, vice versa, if verse X excludes reading P, how can it be the verse that raises the possibility of that very reading? (Gvaryahu’s suggestion that yakhol and minayin derashot establish the hermeneutic markedness of a term is incorrect: hermeneutic markedness precedes and legitimizes derashot; where it is employed, it is a condition of legitimate interpretation not a conclusion). 3. Mikan ʾamru: in the Rabbi Ishmael midrashim, the phrase generally refers to derashot whose conclusion is explicitly identified by the Mishnah as a derashah, or can plausibly be construed as one. In the Sifra, mikan ʾamru often claims midrashic basis for teachings that the Mishnah characterizes as non-midrashic (testimony, “they said,” etc.). I cannot, of course, go into detail here. However, it is important to introduce these arguments because they are the philological core of Scripture and Tradition’s first section, and, moreover, because they speak directly to some of the issues Geveryahu raises in his review. To wit, my claim that the (anonymous) Sifra reworks extra-scriptural halakhot into a midrashic form is supported by a series of arguments regarding the interpretive techniques of this collection. It is not a sense of aporia that leads me to adopt this conclusion, but rather a positive, philological thesis concerning the workings of the Sifra. Like all critical scholarship, my thesis is subject to debate and criticism (“Let the conversation begin”), but for that to happen the review needs, at a minimum, to present the book’s thesis. It is evident that Amit Gvaryahu has read Scripture and Tradition with care and has offered me some important correctives and points of consideration. Any scholar worth his salt wants readers of this sort. My sense that some of the book’s core arguments were not properly represented in the review, does not diminish my gratitude to Amit for his engagement of my book, and to The Talmud Blog for affording me the opportunity to respond. In an attempt at remaining sane during the present Israeli election cycle, I found myself reading Naftali Cohn‘s The Memory of the Temple and the Making of the Rabbis (although given some of the rhetoric voiced here by wannabe politicians over the past few days, one could argue that a book about the Temple is actually quite relevant to Israeli politics). The book, published in Penn Press’ “Divinations” series, attempts to tackle a rather large topic that has been growing in popularity in recent years: the place of the Temple in rabbinic thought. Whereas author scholars like Ishay Rosen-Zvi‘s or Daniel Stoekl-Ben-Ezra have devoted studies to specific topics within Temple-related tractates, Cohn devotes his to the Mishnah’s Temple discourse as a whole; reaching the conclusion that the Mishnaic portrayal of the way in which the rituals were performed at the Temple comes to “claim authority for the rabbis” (pg. 120). Claiming authority over the Temple by depicting it as functioning in a rabbinic fashion is essentially a way for the Rabbis of the Mishnah to gain authority over their fellow Judaeans. Cohn explains that the authors of the Mishnah work on multiple fronts, chief among them being the insertion of the Great Court, the Sanhedrin, into the Temple complex, along with its proto-Rabbinic sages who are depicted as the ultimate deciders of Temple practice. Cohn also argues that the manner in which the Mishnah discusses how and where rituals were performed in the Temple is geared at giving authority to the Rabbis. I admit, I’m not well read in ritual theory, but I’ll note that Cohn’s use of it in his analysis of Temple practice may fill in some of what Meir Bar-Ilan missed in Rosen-Zvi’s monograph. The last chapter of Memory is dedicated to a comparative study of the Mishnah’s Temple, and is entitled “The Mishnah in the Context of a Wider Judaean, Christian, and Roman Temple Discourse.” Cohn combs through a dazzling array of different of sources, such as Pseudepigraphic works, Christian literature, archaeological findings (specifically synagogues and coins), and Hellenistic sources in order to contextualize the Mishnah’s picture of the Temple. Such an attempt should be commended. It is no doubt important, and as Cohn shows, fruitful, to understand the Rabbis’ Temple discourse in such a way. For him, such an analysis proves that the memory of the Temple was a point of contention, and that it was exploited by different communities in their attempts at achieving authority during the Tannaitic period. As noted, Cohn stresses throughout the book the place of authority in Rabbinic depictions of the Temple, but I’m not so sure a) how Temple discourse in the Mishnah really gives them more authority over their fellow Judaeans, and b) if this is really why the Mishnah (and rabbinic literature more generally) spends so much time discussing the Temple. Beyond that, I think that before we can really even compare the rabbinic Temple discourse to that of other communities, the Mishnaic Temple narratives must first be understood in their more local context of Tannaitic literature. Such a contextualization should begin with an understanding of the how the narratives concerning the Temple found in the Mishnah relate to the Mishnah’s non-narrative sections. The vast majority of the Mishnah, including its discussion of the Temple, is not what most scholars define as “narrative.” Additionally, recent attempts at analyzing the Mishnah with an eye for genre have yielded interesting results, at times even pointing out that different layers of genre may contain various Mishnaic conceptions of a given set of laws. Maybe the hundreds of non-narrative sections of the Mishnah paint a very different image of the Temple than the narrative ones do? The inclusion of such information would also change how the comparison between the Mishnah and non-Rabbinic works would be performed: the very fact that Temple is discussed by these different groups would not be the only point of comparison, but rather, the differences in the details of the practices themselves (specifically in the earlier Qumranic material) would also need to be unpacked in order to shed light on alternative conceptions of the Temple. Second, it is very possible that the image of the Temple found in the Mishnah differs from that of the Tosefta or Midrash Halakha. The Mishnah is not the sole Tannaitic text, and, therefore, the “Rabbinic” view of that period probably cannot be deduced from it alone. To be sure, Cohn often uses the Tosefta to better understand Mishnaic passages. At one point, he does more than that, accurately noting a few telling differences between the Mishnah and the Tosefta (pg. 47): the Mishnah never depicts sectarians as actually having the power to perform the ritual as they please, while the Tosefta does so on at least three occasions. Cohn ties this to the Mishnah’s depiction of a “powerful Court that has fully suppressed the sectarians,” a depiction that is absent from the Tosefta. It is very possible that Cohn is on to something here. Scholarship concerning the relationship between the Mishnah and Tosefta has slowly been moving from issues of relative chronology to issues of what may be termed ideology or outlook. This example may be added to the list, and there is a need to further tease out the differences between the idea of the Temple present in these two intertwined Tannaitic works. Similarly, it is very probable that treatment of works of Halakhic Midrash, which to the best of my knowledge are not used in the book at all, would further nuance the position of the Temple in Tannaitic thought. More can be said, and no doubt will be. I don’t think that I have a better answer to questions like “why the Rabbis spend so much time discussing the Temple?” than Cohn does, although I do think that we have to work a little differently in order to respond to them more fully. Nonetheless, Memory marks a significant step in furthering the research into rabbinic conceptions of the Temple in that it forces us to evaluate the Rabbi’s discourse in the context of post-destruction Judaean society. Magnes Press publishes dozens of books related to Rabbinics. Unfortunately, especially now that they are pushing e-book sales, they rarely reprint their older books. One has to be careful to purchase them before they run out. Daniel Boyarin et. al, Atara L’Haim (עטרה לחיים). I found this festchrift for Prof. Dimitrovsky in the press’ catalogue and was pretty surprised to see that it was still available. When I went to their offices to pick it up, so were they. 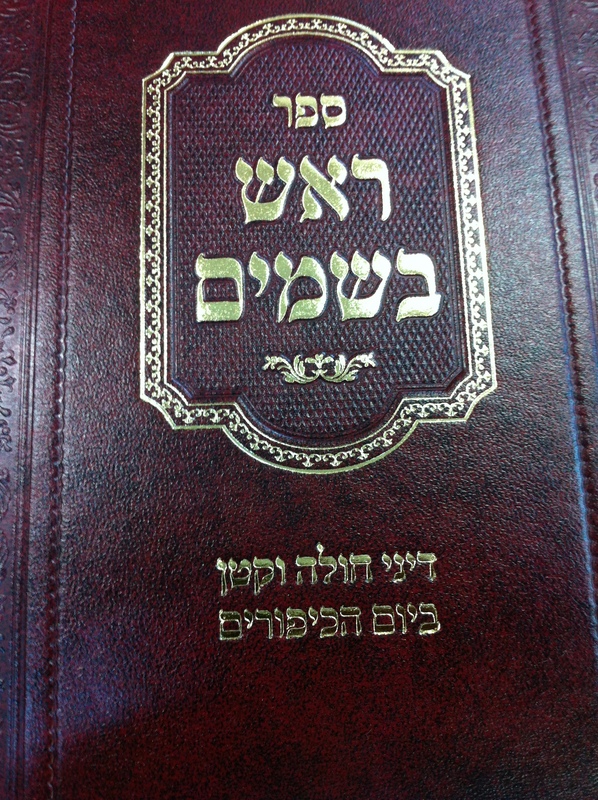 David Weiss Halivni’s Sources and Traditions: Bava Metzia (מקורות ומסורות בבא מציעא). 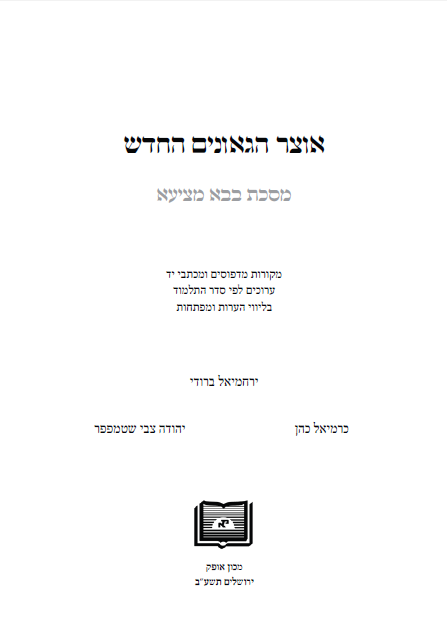 Abraham Goldberg’s Tosefta Bava Kamma: A Structural and Analytic Commentary with a Mishnah-Tosefta Synopsis (תוספתא בבא קמא: פירוש מבני ואנליטי). Ta-Shma’s The Old Ashkenazi Custom (מנהג אשכנז הקדמון), although they’ve been pretty good about reprinting his books. Abraham Goldberg’s collected essays, Literary Form and Composition in Classical Rabbinic Literature , (צורה ועריכה בספרות חז”ל). 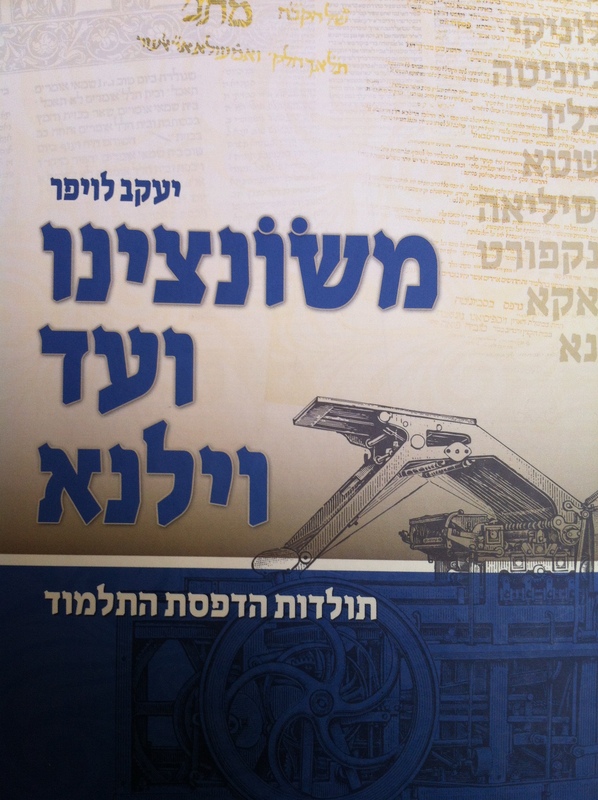 A recent collection of some of Moshe Bar-Asher’s essays entitled Leshonot Rishonim (לשונות ראשונים). A brand new book by Ezra Fleisher, edited by Shulamit Elizur and Tova Beeri, Statutory Jewish Prayers: Their Emergence and Development (תפילות הקבע בישראל בהתהוותן ובהתגבשותן). The same goes for the new edition of Halivni’s Introductions to Sources and Traditions (מבואות למקורות ומסורות), which adds an introduction to Sanhedrin (the commentary to which has not come out yet) and a few corrections to the first edition. For some reason the final volume in Ezra Melamed’s series on Midrashei Halakha in the Talmuds, Halachic Midrashim of the Amoraim in the Babylonian Talmud (מדרשי הלכה של האמוראים בתלמוד הבבלי), which was published last year by Magnes and by Bar-Ilan Press, is still priced as a new book by both [it’s actually a little cheaper at Bar-Ilan; note: one should always check both publishers when a book is jointly published!]. These are just some pointers. Magnes has many other volumes, both new and old, that should be of interest to our readers. They also distribute books published by the World Union for Jewish Studies, meaning that, although they have yet to add it to their online catalogue, they may be selling Emmanuel’s Responsa of Rabbi Meir of Rothenburg (reviewed here by Pinchas Roth) at their stands. Shemesh and Amit, Melekhet Makhshevet (מלאכת מחשבת), mentioned by Amit (Gvaryahu) here. Historian Moshe Beer’s collected essays The Sages of the Mishnah and the Talmud (חכמי המשנה והתלמוד). Sussman’s Thesaurus of Talmudic Manuscripts (אוצר כתבי-היד התלמודיים) is without a doubt the most important book for talmudists on sale this Shavua haSefer. While I hope that we can fully discuss the book in a later post, here’s a brief description. The first two volumes list, alphabetically according to library, all of the manuscripts and manuscript fragments in the world of the Mishnah, Tosefta, Yerushalmi, Bavli and Ri”f. The entries are numbered, and contain a description including the exact contents, and references to secondary literature which may have dealt with them. The third volume contains a few introductory essays- mainly previously published articles of Sussman- and multiple indices. The most important indices, of course, are those that are organized by work. For example: if one is studying m. Bava Bathra 2:7, one can look up the mishnah in the proper index and see the numbers of all of the entries of manuscripts or fragments that transmit that mishnah. One can then look up the entries in the first two volumes, and then look up the manuscripts or fragments themselves. The same is true for halakhot in the Tosefta, and folios of the Yerushalmi, Bavli, and Ri”f. In the field of Geonica, YBZ recently published Shraga Abramson’s edition of Rav Hai’s Mishpatei Shavuot, brought to press by Robert Brody and David Sklare (see here for the table of contents and Brody’s introduction). Ofra Tirosh-Becker’s Rabbinic Excerpts in Medieval Karaite Literature, reviewed by Amit here, is due to become an indispensible tool for philologically minded talmudists. Moshe Florentin’s Samaritan Elegies, a collection of fifty-six poems published for the first time, along with an extensive commentary. Bialik also has a number of volumes of collected essays, such as those of Ta-Shma (Studies in Medieval Rabbinic Literature, in four volumes), and Moshe Bar-Asher’s essays on Rabbinic Hebrew. Shmuel Glick’s A Window to the Responsa Literature (אשנב לספרות התשובות). I haven’t seen this volume yet and would like to hear more about it in the comments section from someone who has. Over a year ago at the International Book Fair, the Schocken stand had a few copies of Abraham Goldberg’s commentary to Mishnah Shabbat. Apparently, they had found some box of them after thinking that they were long sold out. A few months later they were still selling copies during Shavua haSefer and it still appears in their catalogue. To be honest, this saddens me a bit. The commentary, the work of an important teacher and scholar, should be in the library of all those who dabble in academic Talmud. The Ta-Shma memorial volume, entitled Ta-Shma, published by Herzog College, collects over 30 articles in two volumes. Yosef Dan’s recently completed seven volume set on Jewish Mysticism. This list is not meant to be exhaustive. Anyone who knows of any other academic books that should be on our radar is invited to write about them in the comments sections below. The latest Iranica Antiqua has just been published online. The Talmud Blog generally does not announce the publication of every journal from the field of Iranian Studies (or Late Antiquity, Early Christianity, etc etc), even though this might be of use to Talmudists. But particularly in light of our previous treatment of the last Iranica Antiqua volume, the current issue deserves mention. 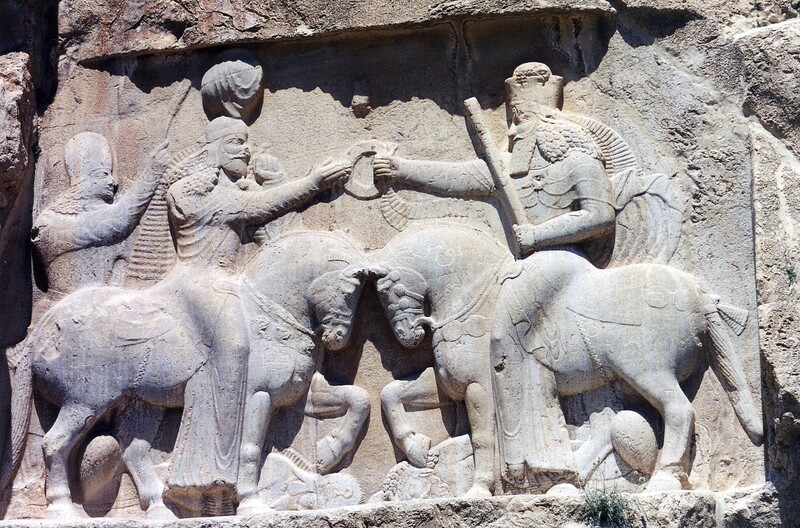 In this issue, T. Kwasman offers readings of the Hebrew graffiti inscribed on Ardashir’s tunic at Naqsh-i Rustam that differ significantly from those previously suggested on this blog by Shaul Shaked. Now Shaked’s readings were extremely tentative, particularly given the fact that he was working from a poor photograph of the graffiti and that it was not for a scientific publication. But a number of Shaked’s point are worthy of serious consideration, and it is a shame that Kwasman did not mention them. Apparently, he does not count himself among the hundreds of regular readers of this blog (or 611 readers of that post); he did not discover Shaked’s readings through a Google search; or more likely, current academic discourse has yet figure out a way to include discussions from sources like blogs in scientific journal articles. Some of the major differences in Kwasman’s rendition include his adoption of a different calendar that results in a 1741 CE as opposed to a 992 CE dating; his reading מן אד\ר rather than Shaked’s מזאר (Persian; ‘visit’); and the month מרחשון as opposed to Shaked’s מן חלון (from Hulwan). Kwasman seems to acknowledge the difficulty of the opening term רברבה, which Shaked rather brilliantly suggested should be jointed to the prior characters and read as הזר ברכה (a thousand – Persian hazar – blessings) – while still acknowledging the problematic final ב as opposed to כ. I would have loved to see some imaginative treatment of what it might mean for a Jewish Persian to visit Naqsh-i Rustam and carve his name on Ardashir’s tunic. Oh well, I suppose there’s little place for that in philological articles. In the same issue, I also published an article that was written during the hot Israeli summer of 2010. It patiently (and rather boringly) attempts to date the named authorities in Zoroastrian Middle Persian writings on the basis of some stray historical references; rather problematic epigraphical data, and charting teacher-student relationships. It is interesting that to my knowledge, it is the first full treatment of the issue, and it took a foolhardy Talmudist like myself, informed by the way things are done in Rabbinics, to attempt it. The translation of the Babylonian Talmud is historically unprecedented, entailing a six-year effort of more than 95 translators, researchers, and language editors under the supervision and leadership of the Middle East Studies Center – Jordan. Hurry to buy the first copy translated into Arabic (20 Volumes). The Babylonian Talmud is considered the most important product of historical Judaism and theoretical religious teaching for Jewish communities. The translation of the Babylonian Talmud into Arabic represents a fundamental shift in the perception of the religious and intellectual foundations of Orthodox Jewish thinking. This translation opens up a wide horizon for academic studies in understanding Jewish religious thought and in recognizing its various manifestations throughout history. Stay tuned for a full review of the edition in the coming months. Otzar Ha-Geonim He-Hadash, Ed. R. Brody with C. Cohen and Y.Z. Stampfer (Jerusalem: Ofeq Institute, 5772). Towards the end of the sixth century, the torch of rabbinic leadership passed from the Amoraim to leaders referred to in Geonic literature as the Savoraim. Their successors, the Geonim of the Babylonian Yeshivot of Pumbedita and Sura, saw themselves as the logical heirs of Talmudic interpretation and Halakhic ruling. For a period of close to 600 years, the Geonim, through their teachings, responsa and halakhic writings (and those of their students) helped to cement the Bavli’s form. Talmud study that considers the perspective of Geonic (and Geonic-era) literature is invaluable for tracing the redaction of the text and the history and formulation of Halakha; and for understanding many subsequent medieval commentaries as well. In practice however, using these texts for Talmud study is a daunting task. Geonic responsa have survived in numerous collections but many of them have not been properly indexed; Many Halachic codes and legal monographs shared the same fate. 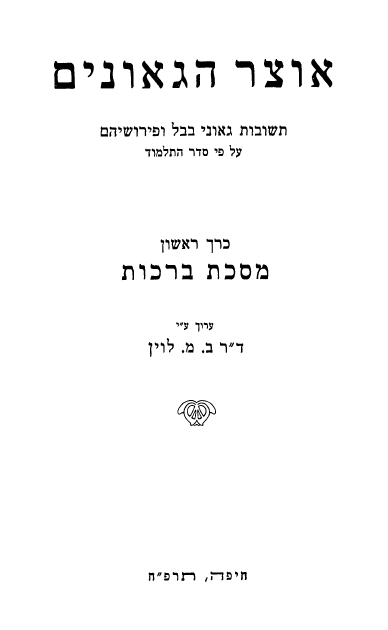 Despite the state of disarray of Geonic literature, from 1928 to 1942, Dr. Benjamin M. Lewin self-published – on his own printing press – 12 volumes of Otzar Ha-Geonim, which he sub-titled “Thesaurus of the Geonic Responsa and Commentaries following the order of the Talmudic Tractates”. Beginning with Berachot and ending – due to his untimely passing – with Bava Kamma, Lewin managed to achieve the impossible. His work did not end with his death: A partial volume to Bava Metsia was published posthumously and his personal hand-lists to tractates Bava Batra and Hullin were included in A. Kimmelman’s index to Geonic literature. Lewin, working alone and under financial stress, gleaned Geonic material from responsa collections, Geonic halachic works as well as newly published Genizah fragments. He divided (in most volumes) his compilations into two sections; ‘Responsa’ and ‘Commentary’, published parallel sources alongside one another in synoptic fashion, included footnotes of his own and from other scholars of his generation (e.g. Professors J.N. Epstein, S. Assaf, S. Lieberman and S. Abramson) and added detailed indices. Later attempts to replicate Lewin’s methods are few and far in between. Aside from Kimmelman’s aforementioned list in Shnaton Mishpat haIvri 11-12, we have H. T. Taubes’ compilation to Sanhedrin (1967) and Y. Cohen’s Ginzei Geonim on the first three chapters of Bava Batra (1995). This is the current literary backdrop against which we eagerly greet Prof. R. Brody’s latest work, Otzar Ha-Geonim He-Hadash. To say that this volume takes up where Lewin left off would be a discredit to the effort and scholarship invested in it. The reader should not expect to find a continuation of Lewin’s oeuvre nor even a revised edition of the older material. Rather, we have before us a fresh volume, meticulously planned from its inception. Each section has been handpicked by the discerning eye of a master of Geonic literature. This task, daunting in itself, required the editor to decide which sources to include, which are merely repetitions and may be relegated to the notes, and which sources, although related to the sugya, are not truly native to Bava Metsia and should be merely cited but not quoted. Gone is Lewin’s partition between responsa and commentary and the reader is no longer required to alternate between different sections of the work. All previously published material has been re-edited against the original manuscripts, alongside of which we encounter much ‘new’ responsa and commentary. Specifically, we are made privy to parts of a soon-to-be-published edition of Rav Hai Gaon’s Mishpatei Shavuot. This edition was originally under preparation by the late Prof. S. Abramson. According to the introduction and bibliography in Brody’s new book, it is slated for publication this year. Along with commentaries to Bava Metsia used as source material, Brody’s notes also reference a section in the introduction, written by Abramson, dealing with Rav Hai’s retractions in halachic decisions (p. 24 no 1). And beyond this exciting news, we are provided with newly discovered sources from texts penned by Rav Shmuel b. Hofni. These include Sefer Hamashkon, Sefer Hat’naim, Sefer Hakinyanim and chapter 74 from his “Introduction to the Mishnah and the Talmud”. The great Geonic innovator also makes an appearance – parts of Rav Se’adyah Gaon’s Sefer Hapikadon and his Sefer Hashtarot are represented in Brody’s volume. These works too are being readied for publication, and we look forward to welcoming their arrival in print. Other novellea await the reader. In Brody’s minimalistic notes, we learn of Rav Sherira Gaon’s knowledge of Greek (p. 152 no. 2 – possible) as opposed to his son Rav Hai’s certain lack of knowledge in this field (p. 120 no. 7). Philological information abounds: Persian loan-words are discussed (see p. 32 no. 8) and the editors, experts in Judeo-Arabic, trace the Arabic etymologies of many words and phrases in Geonic literature (p. 31 n. 7; p. 34 no. 4; p. 215 no. 8; p. 216 no. 1; p. 217 no. 1). Preserved in the notes as well are vignettes from Abramson’s unpublished discourses, a sort of academic “torah she-be’al peh”. Hinted at is his understanding of the phrase “tartei mativta” to mean the Yeshiva of Sura and the parallel yeshiva of the Resh Galuta (Exilarch), contrary to popular convention that this refers to the yeshivot of Sura and Pumbedita (see p. 80 no. 13). Further such gems include one of Abramson’s notes to the text of Mishpatei Shavuot (p. 316 no. 5) and a discussion of an attribution issue related to a particular work (p. 51 no. 8). The following Geonic comments provide a sampling of some of the fair: Rav Hai seemed to have understood the sobriquet “Paponai” to mean “followers of Rav Papa”, contrary to the now conventional definition “those of the city of Paponia” (p. 176 no. 5). From a citation in a responsa attributed to Rav Zemah b. Paltoi Gaon (Pumbedita 872) it is apparent that this Gaon viewed the three “Bavot” as one tractate (p. 212 no. 9). This datum adds to our knowledge of the literary structure of Talmudic corpus as understood in the middle Geonic Era. Those who have studied Bava Metsia are aware that many of the tractate’s passages are attributed by the Rishonim to Geonim or Savoraim. The current volume makes note of this (pp. 25, 72, and 102) and the editor is of the opinion that these attributions are not to be viewed as authentic – providing another viewpoint to the debate as to how the Savoraim and Geonim added to the Talmudic text (if at all). In contrast, see p. 26 no. 2 for a Geonic reading of the sugya, which relegates a part of the text to the “stam”. The editor informs us in his English preface that three more volumes are planned, thereby completing “Otzar Ha-Geonim” on all of Bavli, after which he hopes to “prepare a corrected and updated version of his [Lewin’s] work”. The volume on Bava Batra is cited extensively (18 times), as well as a volume containing Shavuot (pp. 10, 63, 284). Citations to Otzar Ha-Geonim on Sanhedrin are to Taubes’ edition; and no hint is given of whether the remaining three volumes will include Sanhedrin as well. Interestingly, the editor also cites material from the forthcoming volumes to the following mesechtot: Hullin (p. 70), Bechorot (p. 138) and Erachin (p. 131). Otzar Ha-Geonim He-Hadash on Bava Metsia innagurates a new page in Geonic studies. Bava Metsia is a widely studied tractate, from both a textual as well as an halachic perspective. This volume displays a superb blend of academic and traditional Talmud study. Those with an interest in Geonic Talmud commentary would do well to avail themselves of this literary treasure. We wish to offer our thanks to Prof. Brody for undertaking this vast endeavor, and we eagerly await its succeeding volumes on all of the Talmud Bavli. Yosaif Mordechai Dubovick is currently writing a PhD dissertation on Rabenu Hananel at Bar-Ilan University. His publications include “Rabenu Hananel on Tractate Bava Kamma” (Jerusalem, 2011).